Acetaminophen PM Extra Strength Pain Reliever 500mg Generic Tylenol PM 50 Tabs. TYLENOL EXTRA STRENGTH. 500 mg ACETAMINOPHEN. RAPID RELEASE GELS. EXPIRATION DATE AND PAINS DUE TO 02/2020 OR LATER. EACH GELCAP CONTAINS. 50 Pouches of 2 Caplets each Extra Strength. TYLENOL 8 HR ARTHRITIS PAIN EXTENDED RELEASE CAPLETS. Temporarily reduces fever. Contains no aspirin. 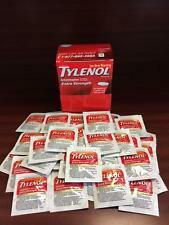 TYLENOL Regular Strength 90 liquid gels. THIS LOT CONTAINS 1 BOX of Tylenol Regular Strength 90 liquid gels. Dated 7/2019. NO INTERNATIONAL SALES. NO INTERNATIONAL SALES. make Supersized seem small. THIS LOT CONTAINS 1 SEALED BOXTylenol PM Extra Strength 225 ct Caplets ,Pain reliever sleep aid Exp 12/2019. TYLENOL EXTRA STRENGTH. ACETAMINOPHEN CAPLETS. 500 mg ACETAMINOPHEN. BOTTLE OF 225 CAPLETS. RESPONSIBLE FOR ALL. 11/2020 OR LATER. EXPIRATION DATE. THIS LOT CONTAINS 1 BOX of Tylenol Extra Strength 225 Rapid Release Gels. DATED 10/2019. NO INTERNATIONAL SALES. NO INTERNATIONAL SALES. 25 Pouches of 2 Caplets each Extra Strength. You get only 25 Pouches of 2 Caplet not the whole box. (500mg each). New Extra Strength Acetaminophen Tablets active ingredient is 500 mg of Acetaminophen and may be used as a pain reliever/fever reducer for adults and children 12 years and over. These Extra Strength Acetaminophen Tablets are easy to swallow, aspirin and caffeine free and gluten free. 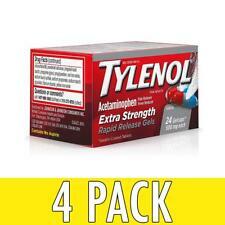 3 Total Bottles Tylenol Regular Strength, 100 Tablets Per Bottle 325 mg of acetaminophen per tablet. When used as directed, it has an exceptional safety profile. Compare to : Tylenol PM. with any other drug containing acetaminophen (prescription or non prescription). With acetaminophen for fast-acting pain relief. Acetaminophen 500 mg, Diphenhydramine 25mg. 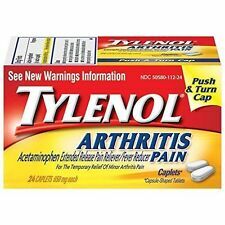 Active Ingredients Acetaminophen 500 mg, Diphenhydramine HCl 25 mg.
TWO BOXES Tylenol 8 HR Arthritis Pain Caplets. 650 mg 24 Caplets In Each Box 48 Total Caplets. 100ct Bottle of Tylenol PM Tablets. Pain Reliever. Contains no aspirin. If there is anything that we don’t have for sale and you are looking for don’t hesitate to ask us if we can get it for you! We stand behind our products and will do anything that we can for you. Compare to: Tylenol PM. with any other drug containing acetaminophen (prescription or nonprescription). With acetaminophen (Paracetamol) for fast-acting pain relief. Paracetamol (Acetaminophen) 500 mg, Diphenhydramine 25mg. TYLENOL 8 HR Arthritis Pain Caplets, 24 Count. Benefits of TYLENOL 8 HR Arthritis Pain. Minor pains of arthritis. Temporarily reduces fever. The common cold. Infants Tylenol Oral Suspension, Fever Reducer & Pain Reliever Grape 2oz Exp9-19. Condition is New. Shipped with USPS First Class Package. YOU GET 3 BOTTLES OF TYLENOL REGULAR STRENGTH 325mg. >EXP:11/21<. 100 TABLETS. Trending at $15.45eBay determines this price through a machine learned model of the product's sale prices within the last 90 days. Tylenol 8 HR Arthritis Pain Extended Release Caplets Pain Reliever 650 mg 24 Ct.
TYLENOL 8 HR Arthritis Pain Extended Release Caplets temporarily relieves the minor pain of arthritis. Vast majority of the products will arrive anywhere between 4 to 7 weeks if not sooner. I always reply within 24 hours if not less. TYLENOL ARTHRITIS. 650 mg ACETAMINOPHEN. ARTHRITIS, MUSCULAR. BOTTLE OF 225 CAPLETS. EXPIRATION DATE RELEASE CAPLETS. RELIEVES MINOR ACHES. 09/2020 OR LATER. For the reduction of fever. Active Ingredients: per tablet: Acetaminophen USP (500mg; Pain Reliever/Fever Reducer). Muscular aches. Common cold. Tylenol Regular Strength Tablets, 100 Count. 325 mg of acetaminophen per tablet. Temporarily reduces fever. TYLENOL EXTRA STRENGTH. COATED ACETAMINOPHEN TABLETS. 500 mg ACETAMINOPHEN. 2 BOTTLES OF 225 TABLETS. 2 BOTTLES OF 225. (TOTAL OF 450 TABLETS). COATED TABLETS. EACH COATED TABLET CONTAINS. Tylenol Acetaminophen, Extra Strength, 500 mg, Caplets, 24 ct. Tylenol Extra Strength Caplets with acetaminophen to provide temporary relief of minor aches and pains and help reduce fever. Tylenol(R) Extra-Strength,1-Caplet Dosage, Total,500 mg 24 Count 10/20 the outside of bottle or box is not perfect shape see photo.it may also have stickers or sticker residue. Compare to the Active Ingredients: Extra Strength Tylenol. Active Ingredients: Acetaminophen 500mg. Inactive ingredients : polyvinylpyrrolidone, pregelatinized corn starch, sodium starch glycolate, stearic acid. Trending at $8.72eBay determines this price through a machine learned model of the product's sale prices within the last 90 days. Directions: do not take more than directed (see overdose warning). Do not take more than 2 caplets of this product in 24 hours. Children under 12 years: do not use. Acetaminophen 500mg / Diphenhydramine 25mg. Exp Date 07/2019 & better. Exp Date 03/2019 & better. Regular strength. 500 mg of acetaminophen per caplet. RAPID RELEASE. EXPIRATION DATE EXTRA STRENGTH. 03/2020 OR LATER. Tylenol 8 HR Arthritis Pain Extended Release Caplets temporarily relieves the minor pain of arthritis. With any other drug containing acetaminophen (prescription or nonprescription). If you are not sure whether a drug contains acetaminophen, ask a doctor or pharmacist. THE BOTTLE HAS 100 650mg CAPLETS. THE DATE IS DEC 2020.